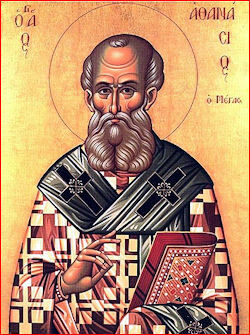 Athanasius (296-373) was an early Church Father known for his effective defense of orthodox doctrine against Arianism, a heresy that claimed Jesus was literally created by God the Father and therefore not divine. On this day before Christmas Eve, I thought it appropriate to share two brief excerpts from Athanasius’s classic On the Incarnation, a brilliant (and at only 60 pages, short!) treatise of the greatest miracle of all: The Almighty God’s taking on a human body, even a helpless infant, to obtain salvation for those who put their trust in him. On Christmas Day many of us will get gifts that, enjoyable and even useful as they may be, are nonetheless perishable and of little value to our souls. Before this time comes, let’s reflect on and give thanks to God for the one gift that surpasses them all: That of his Son, in whom there is not just life, but life everlasting and abundant. “You must understand why it is that the Word of the Father, so great and so high, has been made manifest in bodily form. He has not assumed a body as proper to His own nature, far from it, for as the Word He is without body. He has been manifested in a human body for this reason only, out of the love and goodness of His Father, for the salvation of us men” (4). “The Word perceived that corruption [resulting from our transgression of God’s law] could not be got rid of otherwise than through death; yet He Himself, as the Word, being immortal and the Father’s Son, was such as could not die. For this reason, therefore, he assumed a body capable of death, in order that it, through belonging to the Word Who is above all, might become in dying a sufficient exchange for all…for naturally, since the Word of God was above all, when He offered His own temple and bodily instrument as a substitute for the life of all, He fulfilled in death all that was required…for the solidarity of mankind is such that, by virtue of the Word’s indwelling in a single human body, the corruption which goes with death has lost its power over all” (12-13).